Put a bird on your face. 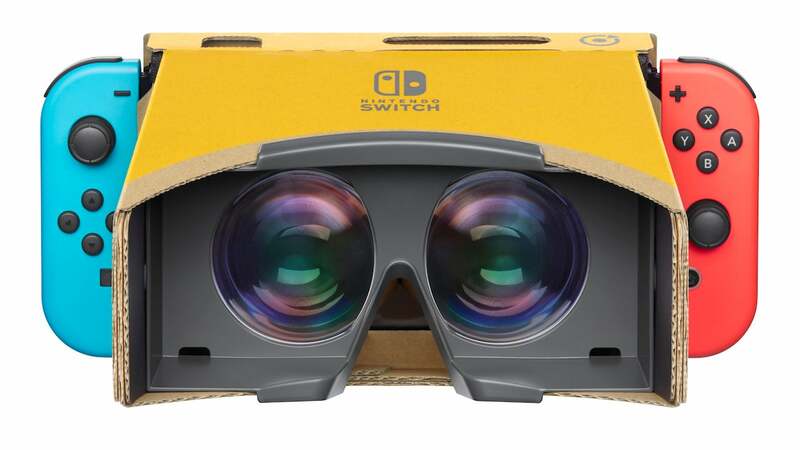 Update (3/21/19): Nintendo has released the first gameplay footage of Nintendo Lab VR in a seven-minute video that looks at everything from assembling the cardboard device to how the games look in action. Doodle (Toy-Con Elephant): Create colorful 3D artwork by moving the trunk of the Toy-Con Elephant through the air, using various in game tools and styles to bring your creations to life. Once finished, show off your masterpieces on the TV by docking your Nintendo Switch. An additional multiplayer game lets you take turns drawing and guessing each other's drawings. Bird (Toy-Con Bird): Soar through the sky on a bird's back, collecting items and helping baby birds hatch along the way. Players flap the wings of the Toy-Con Bird to fly and simply tilt it to the turn. Bird Dash (Toy-Con Bird, Toy-Con Wind Pedal): Compete in timed challenges at racing through checkpoints as you fly through the sky. The Toy-Con Wind Pedal is used in conjunction with the Toy-Con Bird to deliver an extra boost of speed, while also delivering a surprisingly strong puff of air to the player that enhances the sense of flying. Blaster (Toy- Con Blaster): Battle an alien invasion and giant bosses in an on-track experience that requires sharp reflexes and no eye. Kablasta (Toy-Con Blaster): Challenge a friend to competitive hippo feeding . Yes, hippo feeding! Fling different types of fruit toward the hippos to lure them to the side of the pool and score the most points. Hop Dodge (Toy-Con Wind Pedal): As a frog, jump as high as you can on an ever growing stack of balls while avoiding obstacles and heading soccer balls. The wind resistance from the wind pedal will make you feel like you are actually experiencing a breeze. VR Plaza (all Toy Con creations): Enjoy 64 bit-sized games and experiences in VR Plaza, including platformers and puzzlers. Nintendo has announced a new VR kit as a part of its Labo cardboard accessory lineup. According to the official Labo website, this new offering will be available from April 12. There will be a starter set alongside two expansion sets. You will have the option to buy the full kit for $ 80 USD, which will include materials to build all six of the VR Toy Cons included in the other sets. Bird, are from our list of the eight mystery kits we were waiting for from the initial reveal. The starter set will retail at $ 40 USD and will include the materials to build the VR Goggles (which look like a housing for the Switch similar to Google Cardboard) as well as the Blaster Toy-Con (which appears to be a gun-shaped accessory). It also comes with a screen holder and security cap so that games can be played in non-VR mode. The expansions set will go for $ 20 USD each with the first featuring a Toy-Con Camera and Elephant while the second comes with The Bird and Wind Pedal Toy-Con. These will be available through the Nintendo website and you'll need to start the software required for both expansion kits. moment. Labor is also available in some classrooms, helping kids learn basic hands-on skills.